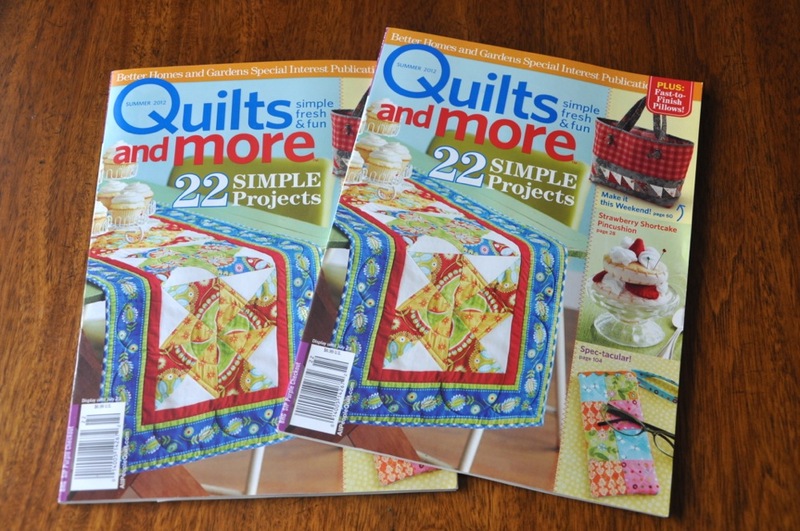 The Quilts & More Magazine Giveaway ended yesterday, April 24th. 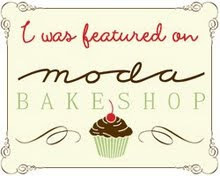 Winner #1 is Sandy D who is new to my blog and doesn't have a blog of her own (as far as I know). 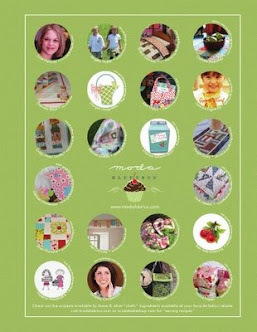 Winner # 2 is Candice from Sunshine Handmade. Go check out her blog. You will love it! I loved reading every one of them and really wish I had had the time to make a reply. 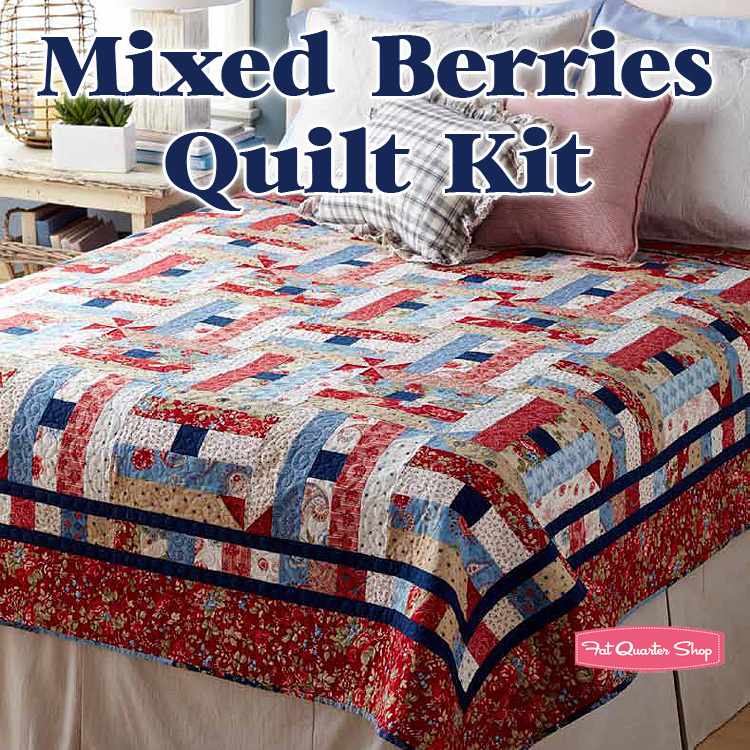 I really enjoyed hearing about the different types of quilts you love to make. 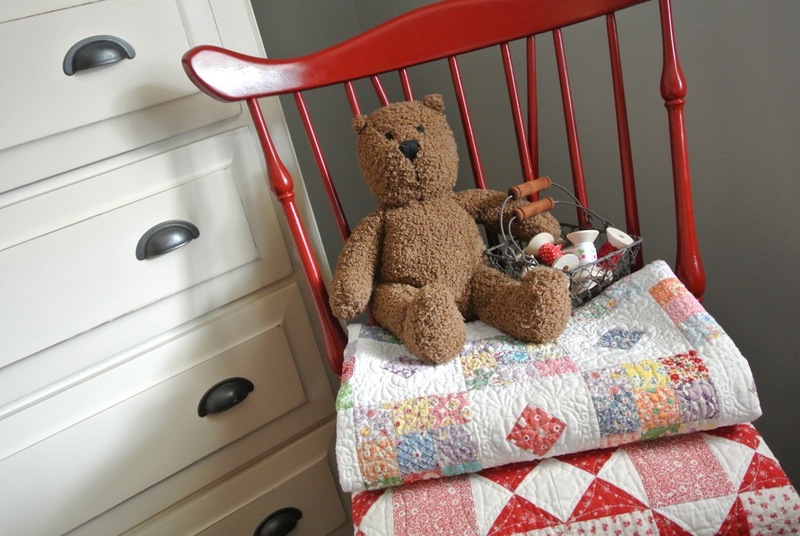 Most of you probably don't know this but, I have a new grand baby coming soon and we've been very busy working on quilts and getting things ready for his arrival. Also, I've been crazy busy helping my daughter plan for her wedding which is coming fast. The date is set for June 1st. More exciting news, we recently had a double University Graduation of my Son and his Wife. Lots of HAPPY things happening in my neck of the woods. The only thing NOT happening is LAUNDRY! Hahaha! I guess I better get to it as we are definitely running out of clothes, socks, and undies. lol. Well, here she is. . .
you still have time to enter my giveaway. 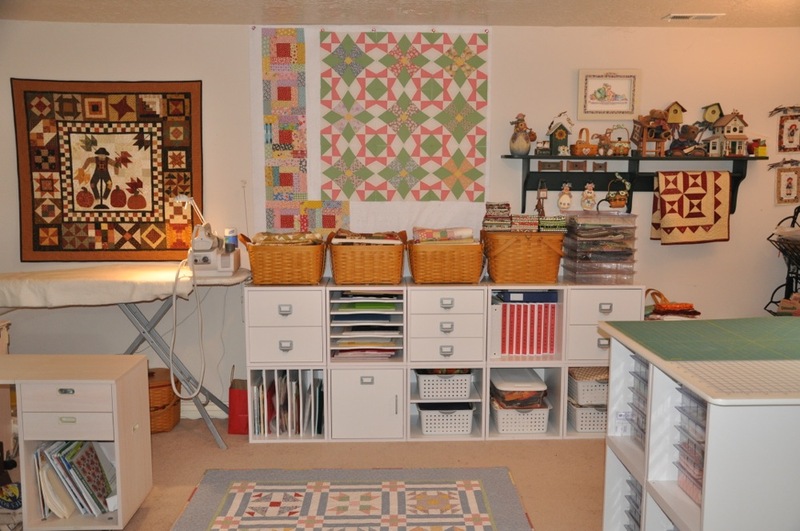 I was at my local quilt shop on Wednesday (a few days ago) during my lunch hour and while I was checking out at the register I noticed the Quilts & More Magazine. It was my understanding that it would be available on April 24th so, you can imagine my surprise to find it so early!!! Here are the two magazines that I will be giving away on April 24th. Enter NOW to win a copy! for my Mixed Berries Quilt from. 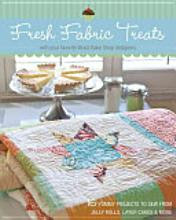 . .
Just click on the link above and it will take you right to the Fat Quarter Shop. Hope you love it as much as I loved making it for you! I'm super excited to announce that. . . TODAY I will be chatting with Pat Sloan. . . For those of you who may not know. 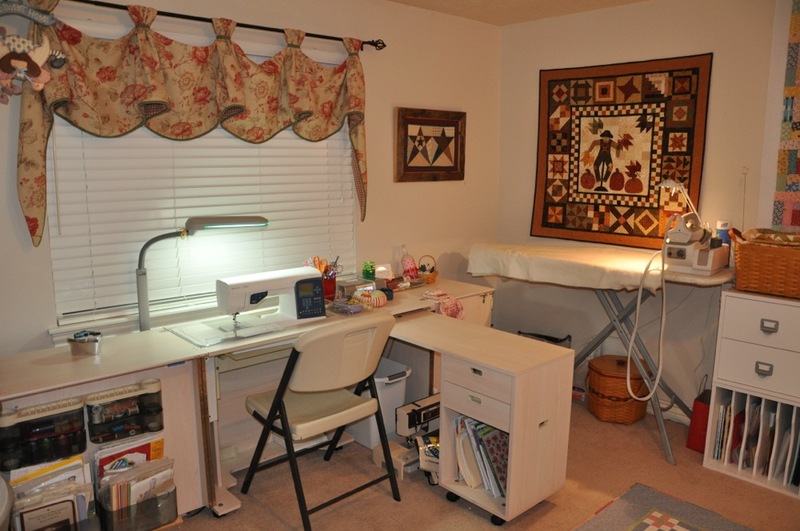 . . Pat is the Host of American Patchwork & Quilting Radio. I'm slightly nervous but, I'm sure we will have a great time talking about the things we love to do. 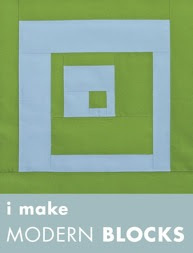 . . like quilting. 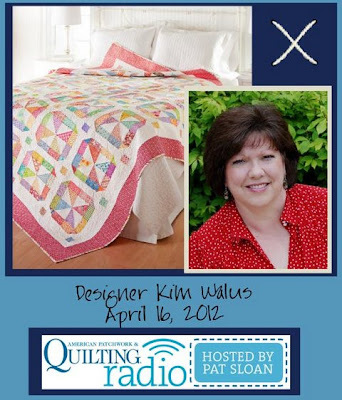 We'll also be talking about my upcoming project that's coming out in the Summer 2012 issue of Quilts & More. The anticipated availability date is April 24th. Tune in today at 4:oopm EST (Eastern Standard Time). You can listen to the podcast by clicking on this LINK and it will (or should) take you directly to the podcast site. Visit Pat Sloan's Radio Show page at Creative Talk Network to listen to previous podcasts. You may also use the above BUTTON on your blog to link to the program. I was just thinking that this is a great excuse for a GIVEAWAY. . .
Would you like to win a fun prize? Well, go ahead and enter. It's easy!!! You have (4) Chances to enter your name in the Giveaway and the prize is. . . 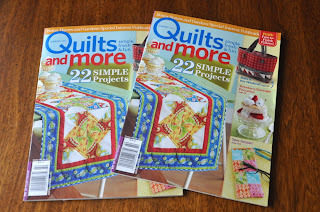 The Summer 2012 Issue of QUILTS & MORE Magazine and I'm going to give away (1) copy to (2) separate winners. 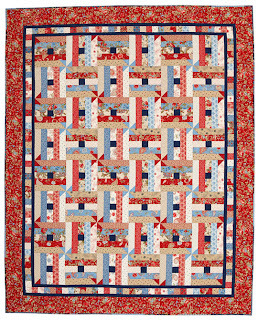 Leave (1) comment telling me your favorite kind of quilts to make. 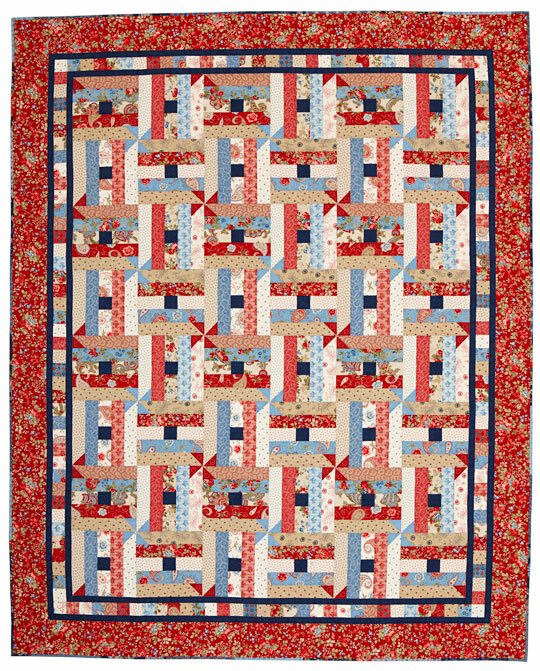 Do you like Reproduction Quilts, Modern Quilts, or are your tastes more Traditional? I'd love to know. Leave another (1) comment telling me you listened to my portion of the podcast (I'm 2nd on the program). 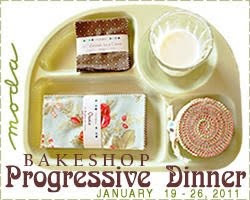 Leave another (1) comment if you mention the podcast on your blog, facebook, or twitter. Leave another (1) comment if you become a new follower or if you're currently a follower. The GIVEAWAY will end on April 24th. I will randomly pick 2 winners before the end of the day by using RANDOM.org Depending on when I get the copies of the magazine I will then mail it to the winner. Please make sure you are NOT a NO-REPLY Blogger. Just make sure there's a way to contact you. If I am unable to contact you I will have to pick another winner. Thanks for joining in on the FUN and I'm looking forward to reading all of your comments!!! I thought it would be fun to post projects that I sometimes make on my Saturdays off. It may not post things every Saturday but, I do what I can. I have another project to post next week and probably the week after that too. I thought that I'd call it something simple like. 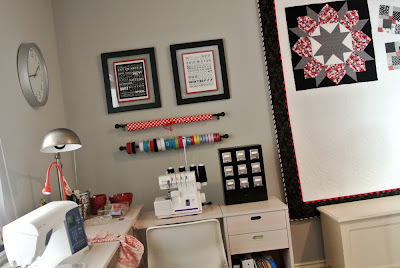 . . Saturday Projects! I know, I know. . . very original, lol. . . but it works for me. This weeks Saturday Project from a few weeks ago is one I did for my daughter's newly painted and carpeted room. 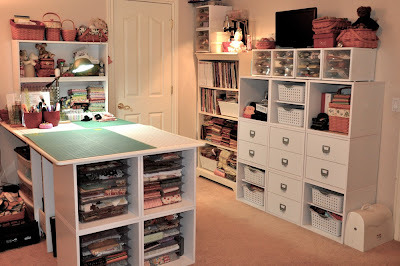 Her room is next door to my new sewing room so she also benefitted from the flood. 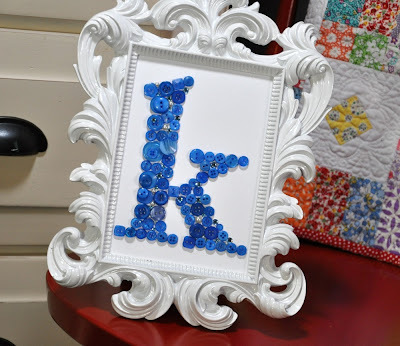 When she saw the button letter that I made for my room she begged me to make a blue one for her room. For those that are on PINTEREST this is nothing new. 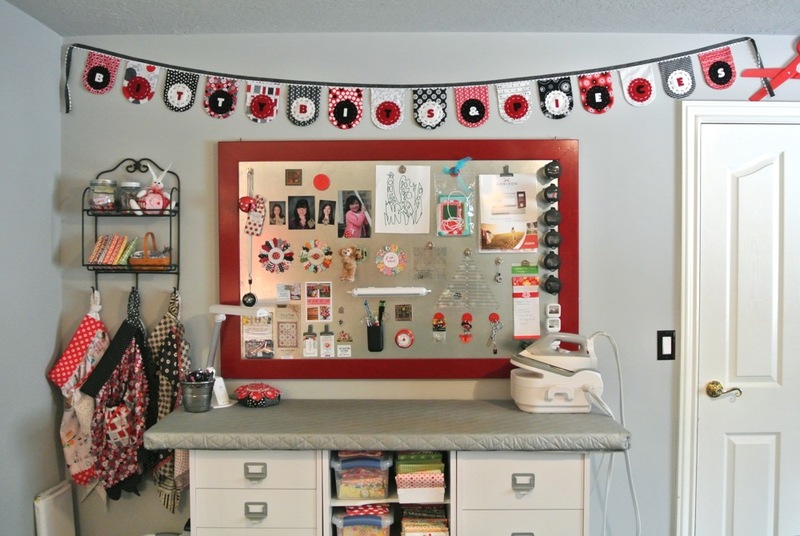 It's actually been a popular PIN on PINTEREST and I've seen a lot of versions along my pinning path. 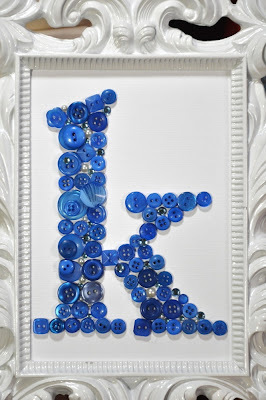 So, here's my version of the Button Art Letter. 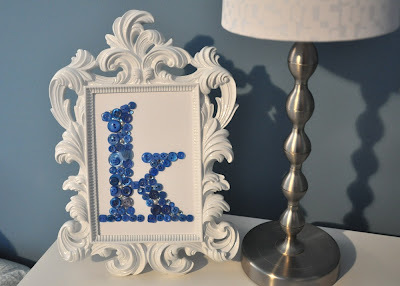 For those that have a name that starts with the letter K. . . you will be very happy to know that you are welcome to pin any of the K's in this post. You have my blessing. . . PIN AWAY!!! Buy an 8"x 10" or a 5" x 7" Picture Frame. Pick a Font. I used Adobe Garamond Pro Bold. Enlarge the letter in a word processing program to fit within the size picture frame opening. I like to BOLD the letter to make it thick and chunky. Print your letter on plain printer paper. Use a light box and lay your printed letter on top of the light box. Then center a piece of blank Bazzill or cardstock (that has been cut to the size of your frame) on top of the printed letter. Tape edges of the paper so it doesn't slip or slide. Now comes the fun part. 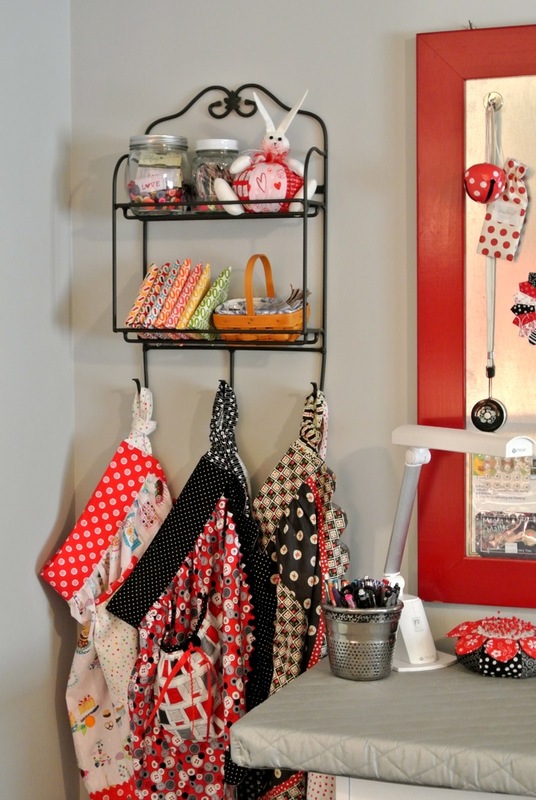 . . pour out your buttons and pick and choose what size, shape, and color you want to use. 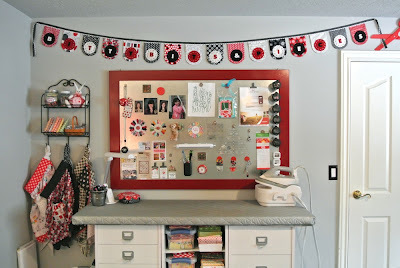 I also used self-sticking gems and pearls from the scrapbooking section of the craft store to fill in the blank spots. Place your buttons within the lines of the letter a few at a time to preview how the buttons look. When you're happy with their position pick up one button at a time and use glue dots to stick them in place, that way they are easier to (gently) pull off and reposition. Continue the process until all your buttons are in place. Finish by putting your button art in the frame. 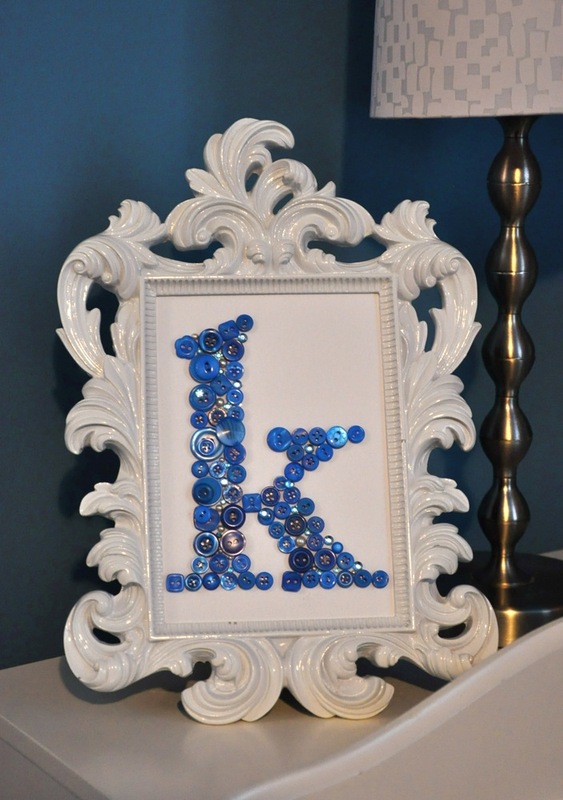 Display your Button Art in your favorite spot. My daughter's frame sits on the bookcase by her bed. I hope you enjoyed this Saturday Project. Do you use the glass from the frame? No, you don't use the glass. It won't fit over the buttons and fit in the frame at the same time. Also, here is a great LINK to buy buttons in bulk. It's called Buttons Galore & More. I've bought their buttons several times and I've been really happy with their service and the choice of button colors and shapes, etc. 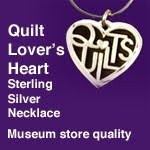 Go check out their website you will see lots of great buttons. On this most sacred day in which we celebrate the Life, the Atonement, and the Resurrection of Our Lord and Savior Jesus Christ I wanted to share this gift with you. It's a 7 minute video about the life and sacrifice of Jesus Christ. I know that he lived and died for each of us. I am filled with deep abiding gratitude for His Love, His Example, and His Atonement. 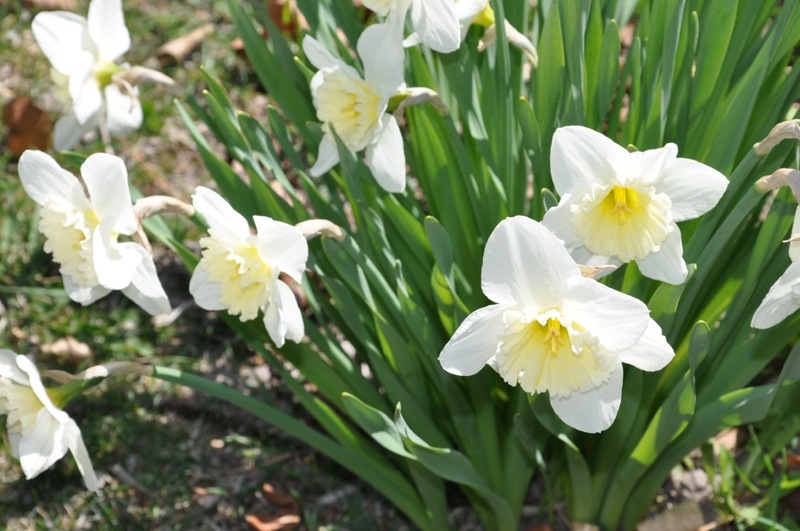 May you each have joy and peace on this very special day. Yesterday was my daughter's birthday and it actually SNOWED most of the day. She was kind of bummed out by that, but TODAY. . . I think Spring has finally come to our neck of the woods as evidenced from the daffodils in my neighbors garden. 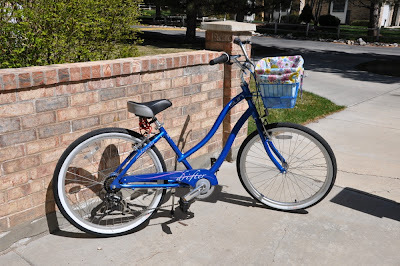 All my daughter wanted for her birthday besides a few spring/summer clothes is a new bike. 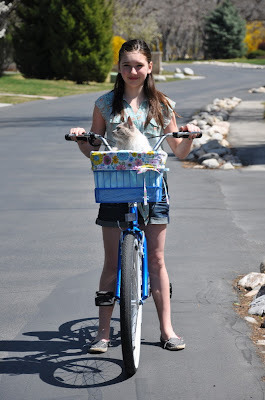 She loves to bike with her friends and the summers are spent riding about and enjoying the lazy days of summer. She's always wanted a basket on her bike and we found this smart duo at a local bike shop. 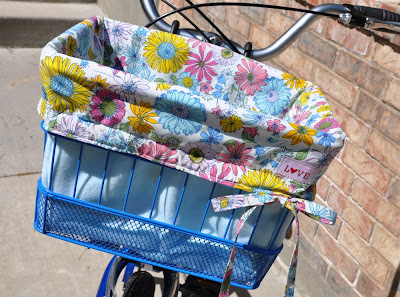 The only thing missing thing was a basket liner which I made this morning. The fabric we actually found at IKEA and the blue fleece was a blanket (also from IKEA) that cost a mere $2.49. We were super excited and bought 2 yards of the floral print that cost $3.99 a yard. What a deal!!! My daughter's friend has the same bike in a different color and I just measured the basket liner that she bought with her bike. 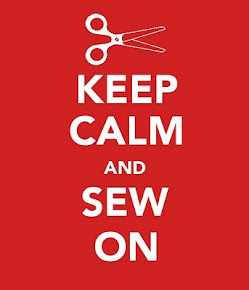 I started cutting and sewing soon after I got up this morning. I couldn't believe how quickly it sewed up. I love how it turned out. I may have to make a few more, they're just so cute! This is our cat Sneakers. He just turned one year old in March and he was our daughters birthday present last year. 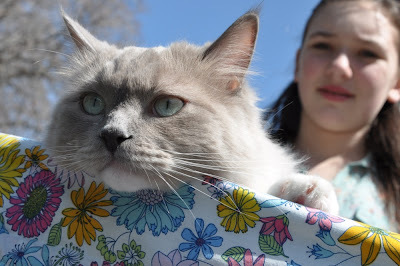 Since he's an indoor cat he can only go outside on a harness and with some supervision. He's a special breed of cat that you wouldn't want to lose. 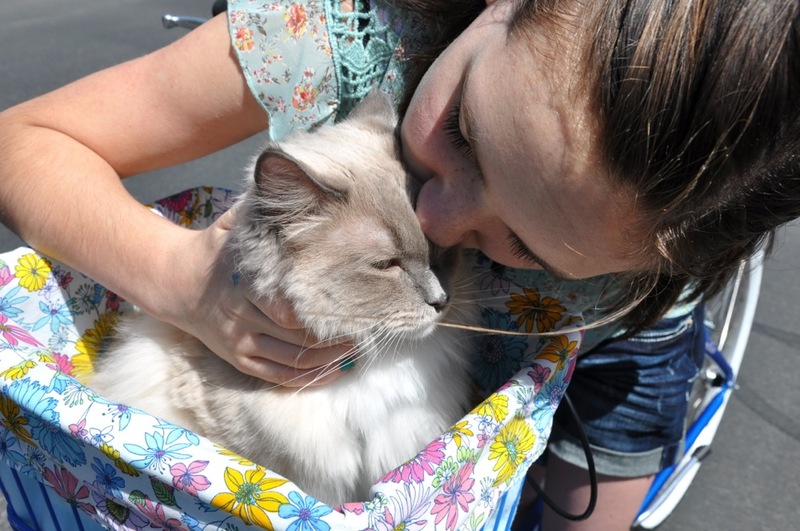 Anyway, he loved sitting in the basket and going for a bike ride and my daughter was in heaven. We tied his leash attached to the harness to the handle bars so he wouldn't jump out but, we didn't have to worry as he sat there perfectly and sniffed the fresh air and soaked in the sunshine. He LOVED it!!! Here they are riding around the neighborhood. They are so happy to be outside on this glorious spring day. Stopping for a little snuggle. 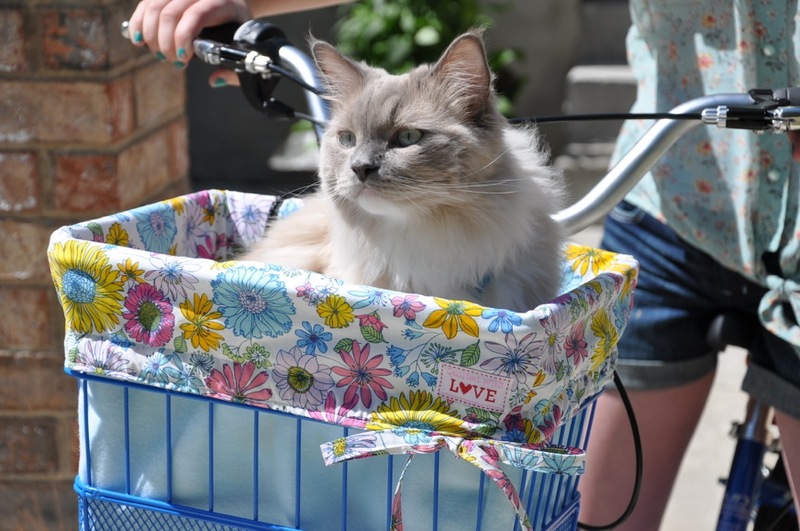 I love how his paw is hanging out of the basket. Hope your Saturday Projects are as fun as ours. Now I'm headed out to do my Easter Shopping. I was a recent guest last week on Amber's blog A Little Bit Biased and wanted to make the same post here on my blog. For those that have already seen this post I'm sorry about the repetition but, for those who haven't seen it, enjoy! I still have lots of things that got pushed to the storage room that I will have to go through later, things that need organizing, things I need to get rid of or donate. 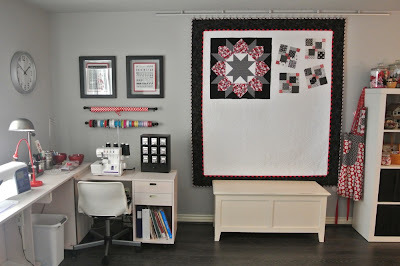 I still have curtains to make and my sewing chair needs to be recovered. I also need to paint my clock RED and find a rug for my floor. But for now, I am very very happy and pleased with the results as you will see from the pictures I've taken. Here's a glimpse of what things looked like before new flooring and new paint. It was a process getting it to this point and I liked it a lot, but there was a lot of clutter and stuff everywhere. The old pinkie taupe carpet had to go. It was 13 years old and ugly!!! My portable design wall is held up with push pins. 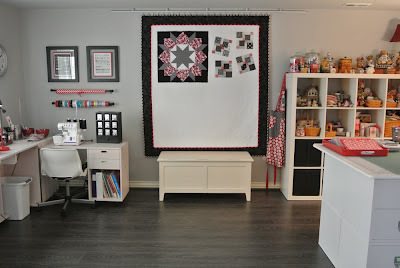 So, if you give a quilter a brand new wood floor. . . she's going to need a new paint color to go with it. And that's how it all happened. Here's a look at the mess that I had to pull out of my room and store in various places like my daughter's bedroom. Luckily she's away at college. lol. 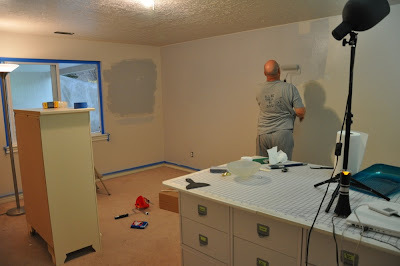 Thanks to my dear sweet husband, Mr. Bitty Bits, for painting and helping me move my crap from room to room to room as we prepared for the new carpet in the basement and the wood laminate flooring in my sewing room. He was a good sport but by the end we were exhausted. This all happened in October and it took us until just before Christmas to get it all back in order just in time for our Christmas company. Also, the wall unit is from IKEA along with the great storage boxes. 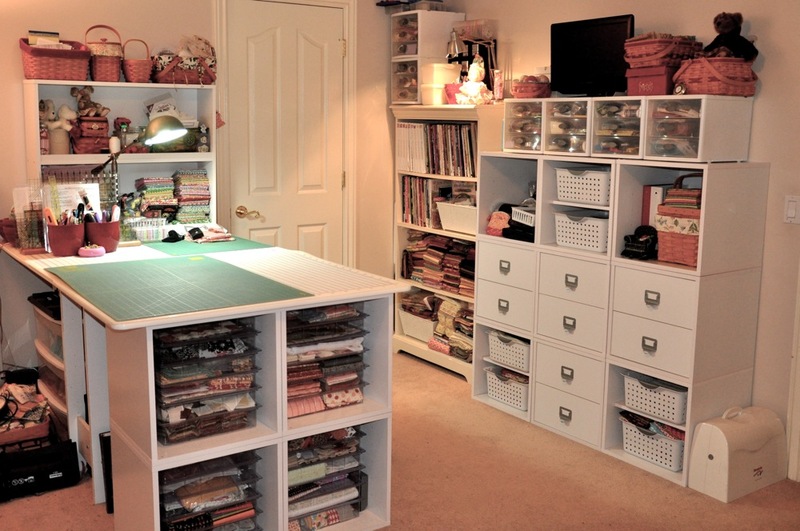 It's quite a functional piece of furniture and holds a lot of my fabric and cute things. The two canvas prints are both from the Moda Girls of Sweetwater fame. 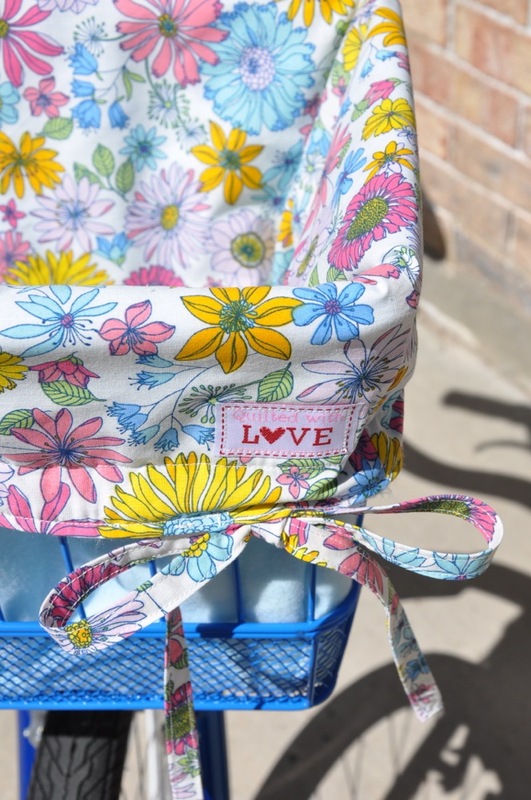 Their blog is Sweetwater MAKE LIFE SWEET. I picked up one of the prints at Spring Market last year and the second one I bought recently at their online store. I matted them both in red cardstock and put them in a floating glass frame that I picked up at Target for $19.99. 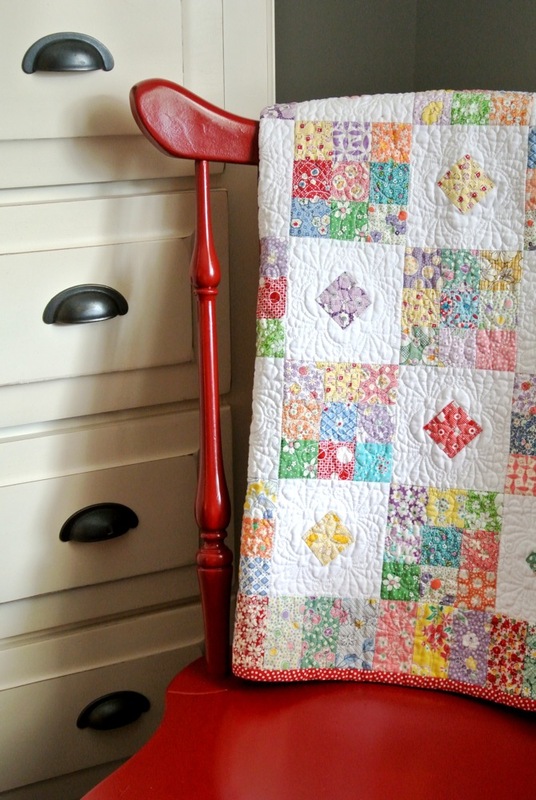 You can also see the smaller version of my Merry-Go-Round Quilt (Cover Quilt on the Feb 2012 American Patchwork & Quilting Magazine) hanging on the wall by the lamp. 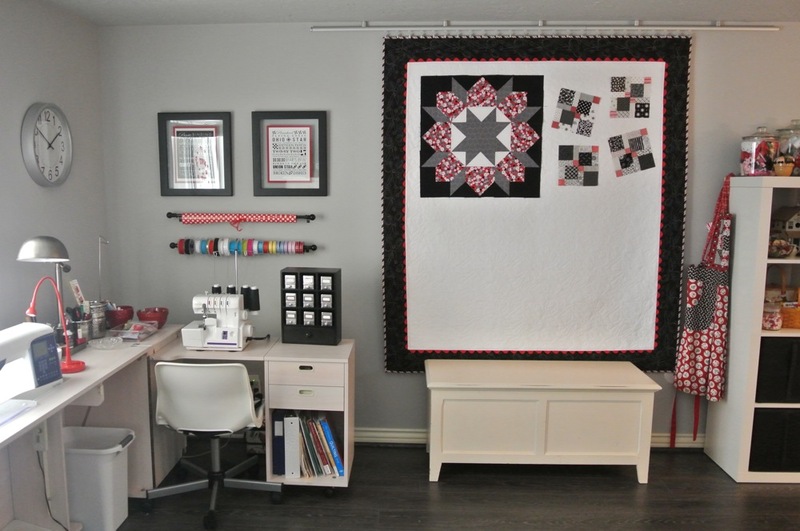 The only difference is that I used mini pinwheels in place of the posts. I found these containers at Target last year and I just knew I had to have them. I started out with about 4 containers and then it grew to 8. Now I have 16 of them. They were a little pricey and that's why I picked them up a few at a time. I don't regret buying them at all. 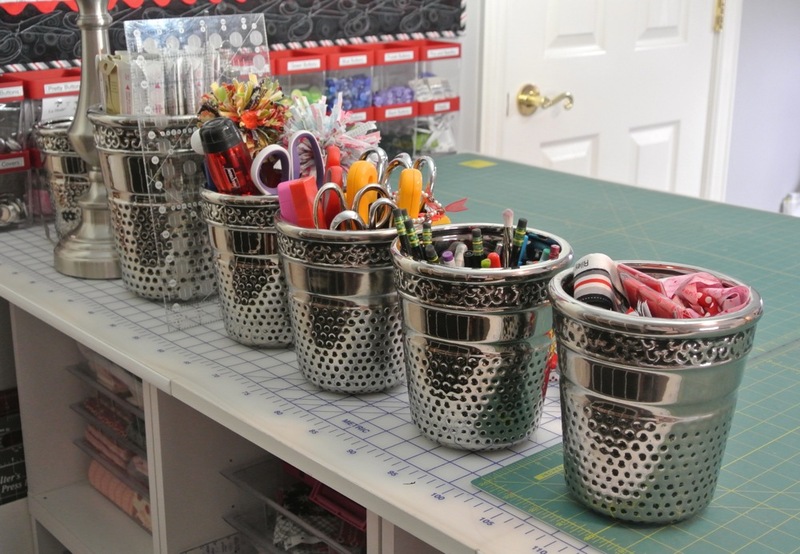 They are a great way to store the things that I use all of the time not to mention how cute they make things look. Besides I just couldn't resist the RED lids. I have one window in my sewing room and it provides a bit of light in the afternoon. 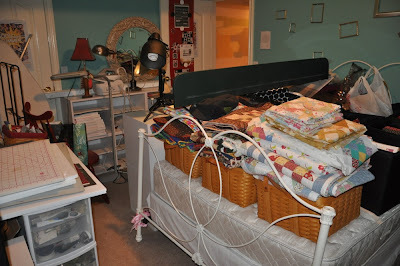 That's the one down fall to my sewing room. It has very poor lighting. I hope to resolve that problem at some point with track lighting of some sort. Anyway, sometimes I can get a good picture in my room when the light is coming through the window in the afternoon. 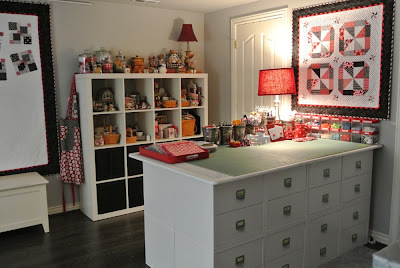 Here's a few pictures of my red chair and my favorite tall dresser that I keep fabric in along with other crafty things. It's a great piece of furniture. 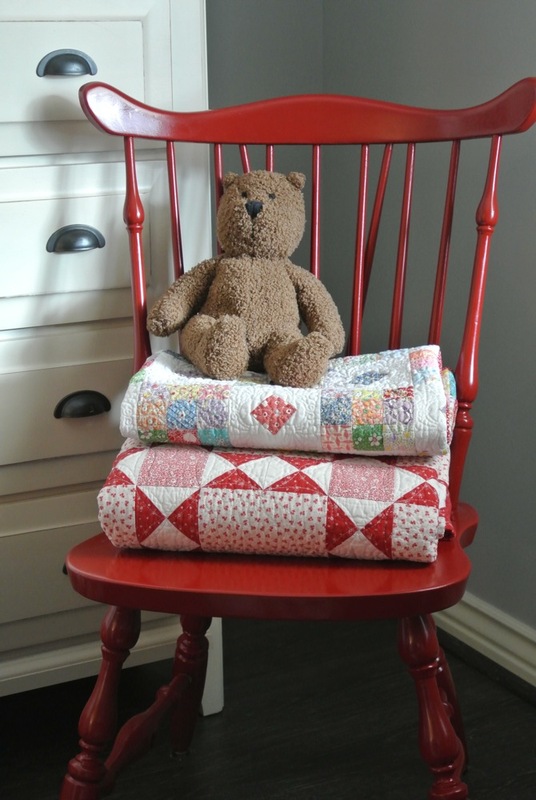 I LOVE my RED chair too!! !